WHAT IS BAIT ADVERTISING AND HOW IT IS DANGEROUS? It is a form of false advertising whereby an item is adver­tised at a sale price but the seller does not have enough stock to last the sale period. It is often noted that consumers end up buying more expen­sive product(s) from the store instead. It is an unethical advertising method that involves luring consumers with the promise of sale of an inexpensive item that they may be interested in but once they have captured the attention of the consumer the advertiser then, makes the product unavailable and directs the consumers to buy some­thing more expensive. This is a dishonest marketing tactic in which a marketer ad­vertises a very attractive price/rate/term that is in-fact just a teaser rate meant to lure customers. A trader advertising on social media to lure potential clients into purchasing a product(s) but the items are not delivered as promised. 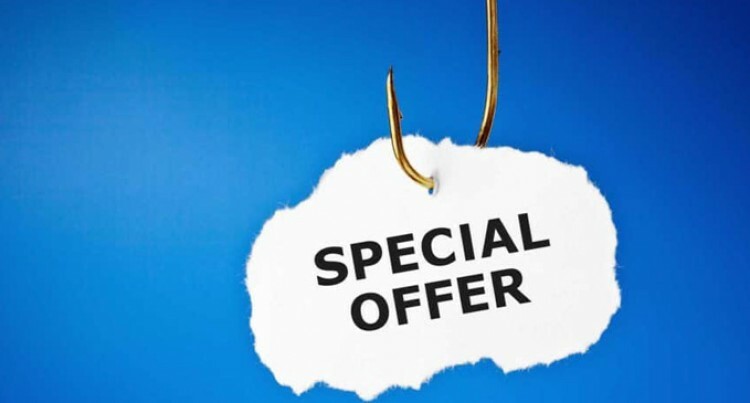 One common example of bait and switch sales tactic, is when used car dealers advertise extremely low price(s) for vehicles which have a very limited number in stock. They make it seem like a deal you can afford, but when you get to the dealer, the car is already sold. In this case, the dealer will offer to show you other vehicles you might be interested in. This is an illegal practice of ‘baiting’ customers with unreal­istically low prices to bring them into the store and then try to sell them higher-price goods on the pretext that the advertised bargain-priced goods are sold out. It is also called bait pricing. One bait and switch technique that retailers use, is to offer a free accessory with a popular product to drive foot traffic to the store. For example; a retailer may offer a free ink cartridge for each printer sold while supplies of the cartridge last. But the supplies are limited and are gone by the time major­ity of the consumers arrive at the store. In lieu of giving you a free cartridge, the store will try to sell you one instead. Financing can be a convenient way for consumers to make larger purchases such as cars, home appliances or furniture. Companies will promote low financing rates as a major focus of their advertising for an upcoming sale. The promise might be that everyone will be eligible for fi­nancing, or that financing is available at an interest rate as low as zero per cent. It is important to read the fine print in these ads. The bait and switch in this type of advertising is usually that only people with excellent credit migh qualify for zero per cent financing. The switch is when people do not read the fine print and are met with a long list of conditions after they’ve already decided to buy an item. For example, if you see an advertisement that promises a free television to everyone that purchases a new vehicle, tel­evision shown is a 52-inch television, you may be tempted to check out the dealer’s cars because of the 52-inch high defini­tion television you saw in the picture. However, you notice in fine print that, the actual television they are giving away is not pictured.